NEVER BREAK A GLASS AGAIN! With Taza drama-free unbreakable wine glasses you can entertain in style, without the worries. TaZa unbreakable wine glasses are known for their brilliant clarity-such clarity that makes them easily mistaken as crystal. Unlike crystal, however, these glasses won't crack or break, which makes them ideal for entertaining anywhere, anytime. 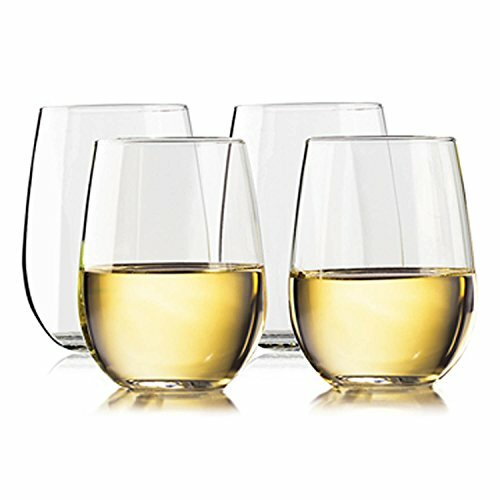 These shatterproof 16oz wine glasses allow you to enjoy your wine, water, cocktail, juice or smoothie indoors or outdoors (think pool, patio, boat, campground, RV,rental cabin, etc)! Besides our durability, what else makes us better than our plastic competitors? For starters, we use USA patented Eastman Tritan(tm) plastic, which is 100% BPA-free and EA-free. We don't believe that you should have to be worrying about yucky chemicals leaching into your drinks. We don't have tolerance for that junk-and we don't think you should, either. We've also paid special attention to our rim-because there is nothing worse than a plastic cup rim that's rough and nips at your lips. Who needs that? We've managed to make extra-smooth rims while keeping our glasses ultra-thin-quite a feat! Lastly, TaZa shatterproof glasses are actually dishwasher safe!! Avoid being stuck at the sink after a dinner party washing by hand-just throw your Taza glasses in the dishwasher on a non-heated setting, and head to bed! We're your best no-break, no-fear, crystal-clear, BPA-free, lip-saver, dishwasher-safe, party-on choice! Eastman and Tritan (tm) are trademarks of Eastman Chemical Company. *NO LOGO ON GLASS * PREVENT PARTY DRAMA with shatterproof wine glasses. TaZa wine and water glasses won't break if dropped, leaving you free to enjoy company without the worry of breakage. Perfect for outdoor picnics & camping and around the pool, patio, or boat. Anywhere that you do not want broken glasswe have you covered. ENTERTAIN IN STYLE with crystal clear 100% TRITAN plastic glasses that provide the brilliance of a fine glass. Theres no need to sacrifice practicality for claritybe prepared to receive compliments on how well they showcase wine, cocktails or any other drink you serve. ** BPA-FREE & EA-FREE ** & DRAMA-FREE. Made with 100% USA made material. Keep harmful ingredients out of your drink. PRIORITIZE YOUR PEACE OF MIND: Regular plastic leaches chemicals into drinks, our USA Tritan plastic is not only some of the safest, its also durable to be washed in the dishwasher. DISHWASHER SAFE. PERFECT AROUND KIDS, DOGS & TIPSY FRIENDS. Unlike typical glass, TaZa shatterproof wine glasses can get knocked off the counter and bounce without shattering. ENJOY ALL OF YOUR FAVORITE BEVERAGES. A TaZa! 16 oz wine glass is perfectly designed to be versatile for any drink. Enjoy wine, water, cocktails, lemonade, juice, or even dessert. Theyre lightweight and comfortable to hold even for kids. If you have any questions about this product by TaZa, contact us by completing and submitting the form below. If you are looking for a specif part number, please include it with your message.